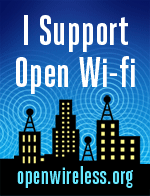 Yes, open wireless everywhere would be beneficial from a practical sense. Let me call attention to something amazing: this is a call for voluntary participation rather than begging for a government edict enforced at the end of a gun. And Comcast immediately responded by temporarily opening their xfinity network.